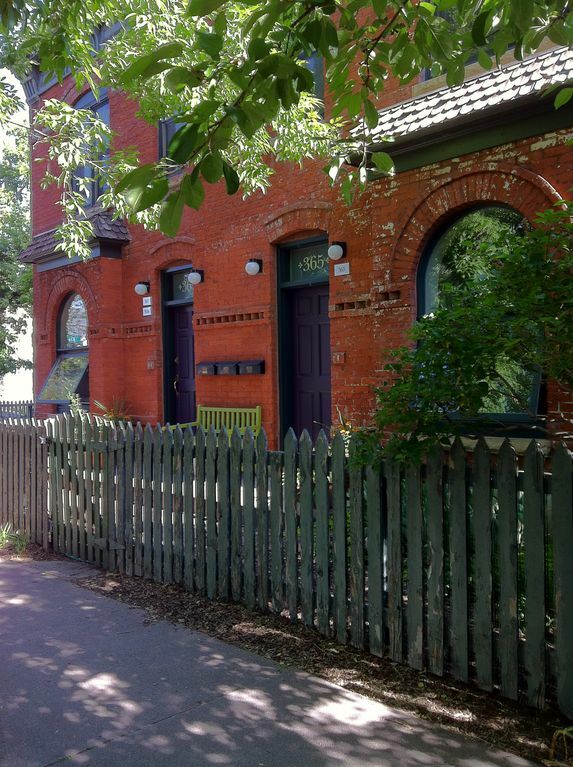 Our Guest House is located in the heart of the Baker historic neighborhood in a hip, diverse, urban setting. Situated on a quiet, tree lined street, the apartment reflects an eclectic, artistic style. There is original art throughout the place, exposed brick walls, hardwood floors, ceramic tiles and a mix of old and new. It is nice, relaxed and very comfortable. And we just replaced the old sofa with a new one! This is a great place to stay while in Denver, whether for work or play. The idea for our guest house was to create a place that we would want to stay while we are in town! This ground floor unit is 650 sq. ft. with a private entrance to your home away from home, with on-street parking steps from your front door. It has 1 large bedroom with office, WiFi, a full kitchen with a dishwasher and microwave. Plus a washer/dryer in the unit. The bedroom is very large with a Queen bed and there is a desk and work area. All the office supplies that are stocked here can be used, including an HP printer. Guests can even use the art supplies if they like. There is a shared deck off the bedroom with a gas grill that is situated in a beautiful, mature garden. Our guests really like this feature, they say it's a great place to sit and enjoy their morning coffee. A three block walk to unique boutiques, vintage furniture stores, indie movies, book stores, coffee houses, yoga, pilates and a great mix of restaurants and nightlife. A couple new distilleries have opened including the locally owned Denver Distillery. Six block walk to light rail, a 3 minute drive to the Santa Fe Arts District with scores of galleries, a 5 to 7 minute drive to downtown and a 10 minute drive to the Cherry Creek shopping district. You can walk or drive to the Denver Art Museum, Clyfford Still Museum, and the just opened Kirkland Museum of Fine & Decorative Art. A lot of our guests include traveling nurses, who are looking for their home away from home while they work at nearby hospitals for an extended time, grandparents who want to stay in a place of their own while they visit their kids and new grandchildren, and couples on vacation. Desk and work area. Office supplies stocked including an HP printer. Guests can even use the art supplies if they like. Loved it so much we’re extending our stay! Bari’s place is incredible. We were in the process of moving to Denver from overseas and needed somewhere in between - it instantly felt like home! Location is incredible and the neighbors are great. Couldn’t recommend more! Thank you Ashley. We are delighted that you are enjoying our guest house! I stayed at this property for 7 weeks. I was able to spend time with my family through the holidays. This apartment was lovely, clean, efficient, and had a very safe feel. I loved walking through the historical BAKER neighborhood, neighbors were so helpful and friendly, shopping and restaurants were exceptional. I have already booked the same property for same time frame for next year. A great bargain. Thank You! We are glad you enjoyed your stay and look forward to your next visit! Location in Baker neighborhood was perfect for me. Property is attractive, art-filled, comfortable and super clean. Very comfortable. Nice neighborhood. Owner and other renters very friendly and helpful! This was our 4th stay so obviously we love this historic art studio apt. We have always felt at home in this wonderful historic art studio apt. It has everything you need whether staying for a week or a month. It is always spotless when we move in. It is also in a friendly, walkable neighborhood with Broadway just a few blocks away. We will be back again. Great place. A few lights were not working, but Bari is super easy to work with. Very hands off if that is your deal. 6 block walk to light-rail and a 10 minute drive to Cherry Creek Mall. A 3 block walk to unique boutiques, vintage furniture stores, indie movies, book stores, coffee houses, yoga, pilates and a great mix of restaurants and nightlife.